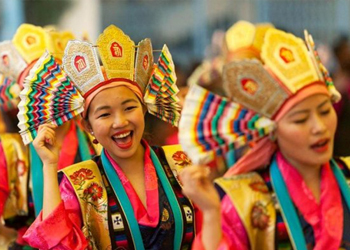 The Losar festival starts on the first day of the 11th month officially. Each and every men, women and children make an active participation during the Losar celebration. The custom that is followed during the Losar is an interesting blend of the Buddhist and the pre Buddhist Bon religious practices. It is at the end of the harvesting season that people start doing preparations for celebrating Losar. There are provisions that are stocked and goats and sheep kept for the elaborate customary feasts that form an integral part of the Losar celebrations. A local barley beer called Chang is a popular drink for the Losar celebrations and grain from the harvest is kept for its brewing, as a part of preparations for the Losar celebrations. People wear new clothes and adorn themselves in new jewelry to enhance the festive mood in the air. The slaughtering of the goats and the sheep which were kept reserved for the festivities are done with a ritual to mark the beginning of the Losar celebrations.